Address: 407 N. Virginia St. 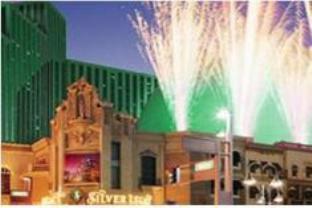 Discover all that Reno (NV) has to offer with Silver Legacy Reno Resort Casino as a base. This 3-star hotel offers 1,720 comfortable guestrooms with a range of in-room facilities suitable for the modern traveler. All of the guestrooms are replete with non smoking rooms, air conditioning, inhouse movies, desk, hair dryer, ironing board. To suit guests' convenience, this Reno (NV) accommodation offers shops, casino, elevator, bar/pub, meeting facilities, restaurant. To unwind, guests can enjoy the leisure facilities provided on the hotel's property, including massage, jacuzzi, gym, sauna, spa. Modern comfort and convenience are seamlessly combined to ensure the guests' satisfaction. Make your reservation at the Silver Legacy Reno Resort Casino Reno (NV) now by selecting your chosen dates of stay and submitting our secure online booking form.